Get on the expressway in the direction of Dao Khanong and cross Rama IX bridge. After crossing the bridge, follow the signs to Samut Sakhon. You will drive approx. 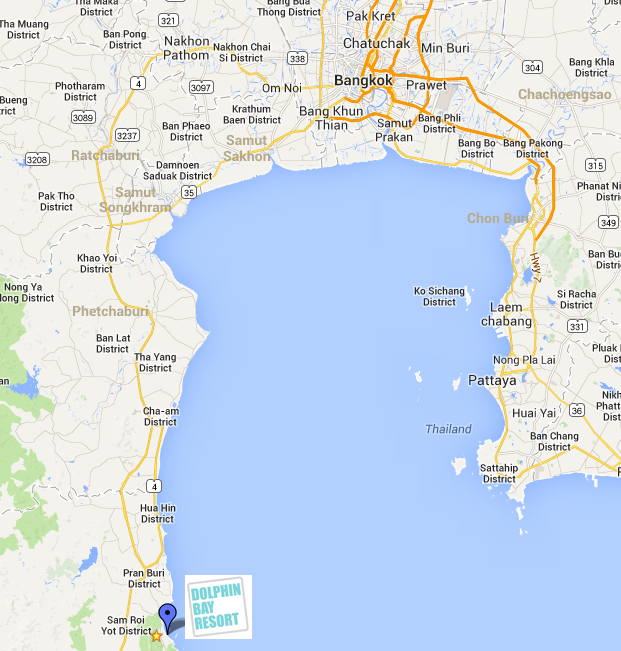 100 km in a straight line south, passing Samut Sakhon and Samut Songkhram, and finally will reach a fork in the road – right to Ratchaburi, left to Phetchaburi. 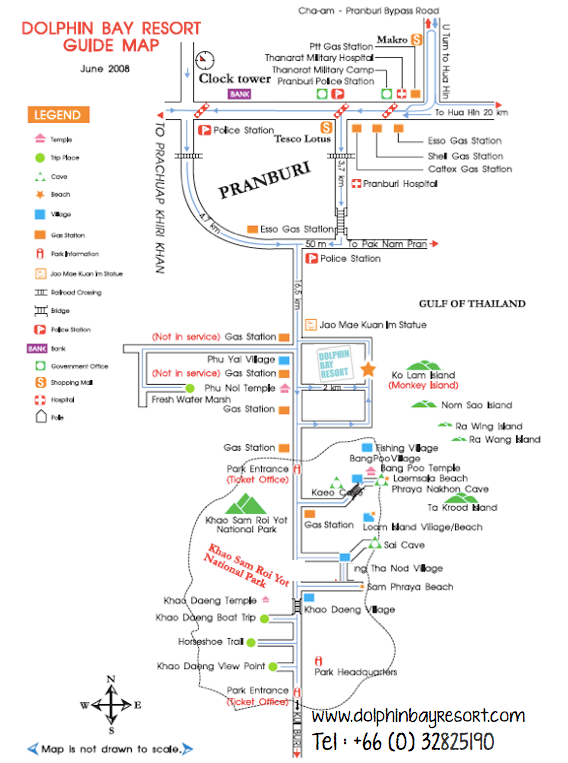 Go left and continue on to Phetchaburi.When you reach Phetchaburi, there will be another fork – left into Phetchaburi town, and right to Prachuap Khiri Khan. Once you turn onto the bypass road, you will drive straight ahead for approx. 50km. The bypass road then merges back to the main Phetchakasem Road and continues on into Pranburi (You’ll see a Makro Cash and Carry on the right just before the road merges). After you merge back onto the main Phetchakasem Road, continue on straight ahead. Drive through the first traffic light in front of Thanarat Military Camp, continue on past the Esso, Shell and Caltex petrol stations on the left, and then turn left at the second traffic light (a Tesco Lotus Superstore is on the corner). After turning left at the light, follow that road to the end for approx. 3.7km – you will go over a railroad crossing, pass Pranburi Hospital and after going over a small bridge will end up at a T-junction. Turn right at the junction, and then immediately left at the little police station. From the police station, drive 16.5 km straight ahead towards the entrance to the park. After 16.5 km you’ll see a Thai temple, Wat phu noi, on the right. Turn left down the little road opposite the temple and drive straight about 2 km until you come to the beach. Turn left on the beach road. Dolphin Bay Resort lies 60 meters ahead – it’s easy to recognize by the two large swimming pools and big water slide! Parking is at the rear of the resort. Turn left onto the access road which runs along the far wall of the property.